Since switching over to Managed Healthcare our agency have been more than please with the efforts of all the Managed Healthcare staff. They are quick to respond, they deliver medications on time even when prescribed by Urgent Care or an Emergency Department. When we have questions about medications, billing or other changes, they are always friendly and cooperative. Working with them it is clear they have the best interest of the people we support in mind. Managed Healthcare Pharmacy is a trusted and valued partner. The customer service that we always receive is top notch. I especially appreciate the collaboration and problem solving that occurs whenever there has been a barrier to getting what is needed for our mutual customers. I highly recommend their services. Our experience at ElderHealth & Living with Managed Healthcare Pharmacy (MHP) has been wonderful. Continuously providing us with the tools to improve resident care and operate more efficiently. MHP is always willing to work with us to find workable solutions to any problems that may arise and provide valuable education to our providers and nurses. They take the time to get to know their customers on a personal level and are always just a phone call away. I would highly recommend Managed Healthcare Pharmacy for all your pharmacy needs. When your facility chooses to partner with Managed Healthcare Pharmacy, we strive to provide a seamless transition. Our New Facility Representative will guide you through the process for a stress free transition. Your assisted living or residential care facility will receive standard and customized services. At MHP, our goal is to provide exceptional service and assistance to you, your facility, and staff so you can focus on giving the best care to your residents. Open communication is an essential part of what makes our customer service great. The cornerstone of MHP is providing good customer service. For your comfort and safety, Managed Healthcare Pharmacy’s delivery drivers are full-time staff members. You can count on friendly, fast service. As skilled professionals with an extensive range of skills, pharmacy consultants are valued members of our team, helping you to achieve optimal outcomes for your residents. Our pharmacy software allows us to seamlessly interface with any of the leading EMAR companies. Our team is well versed in many of the leading EMARs available today making your transition from paper MARs a breeze. We also offer free guidance to help you pick which EMARs is right for you and your facility. COLOR-CODED MARs saves time by eliminating the shuffling of various charts, stopping to read each one. This is a simple upgrade, but this simple idea is most useful for moving quickly through the charting task, and improving accuracy by helping to prevent human error. If you are new visitor to Managed Healthcare Pharmacy, welcome to our family. We have a hands on approach for each one of our pharmacy transitions. Have you been lost in the shuffle with pharmacy buyouts and mergers? Do you feel overlooked, under appreciated, or just plain ignored? Join Managed Healthcare Pharmacy to receive first class service. You’ll be happy to discover that transitioning to Managed Healthcare Pharmacy is so easy that we call it ‘hands free!‘ We do all the work. We provide the right medication … to the right people … at the right time. Established in 1991 we have achieved our successes for over 20 years by continually exceeding our customers expectations. Providing pharmacy services throughout the state of Oregon, Managed Healthcare Pharmacy has become the pharmacy of choice for many LTC Facilities. With a unique delivery system and cutting edge technology, MHP has stayed up to date with Long Term Care standards allowing our Pharmacy to provide the highest level of pharmacy services to your facility. When your facility chooses to partner with Managed Healthcare Pharmacy, we strive to provide a seamless transition. Our New Facility Representative will guide you through the process to ensure quality assistance and demonstrate the service you can expect for all future dealings. Your assisted living or residential care facility will receive standard and customized services to suit your particular needs. From the moment your order hits our system, accuracy, security, and fast delivery becomes the highest priorities. A Pharmacy Technician reviews your order and places it into the system. A licensed pharmacist verifies every piece of your order. Pharmacy technicians fulfill your order. Your order is moved forward to a pharmacist to secure fulfillment accuracies. Our delivery staff completes a final count check in staging. Our delivery team sees that your order is safely delivered on time. We provide the right medicine to the right people at the right time. Emergencies happen and we are here to help. 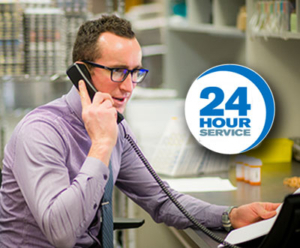 We have 24-Hour Pharmacy and a delivery service available 24/7. We can set up your account – in most cases – within an hour. And we can begin deliveries within a day. The most efficient pharmacies are continuously engaged in the process of improving internal systems and procedures. One major part of these workflow improvements is the implementation of a pharmacy clinical workflow management system called DocuTrack. Specifically designed to solve the document management needs of pharmacies, its state of the art workflow system enables pharmacies to organize, route and retrieve documents faster and more accurately. MedlinePlus is the National Institutes of Health’s Web site for patients and their families and friends. Produced by the National Library of Medicine, it brings you information about diseases, conditions, and wellness issues in language you can understand. MedlinePlus offers reliable, up-to-date health information, anytime, anywhere, for free. You can use MedlinePlus to learn about the latest treatments, look up information on a drug or supplement, find out the meanings of words, or view medical videos or illustrations. You can also get links to the latest medical research on your topic or find out about clinical trials on a disease or condition. Managed Healthcare Pharmacy is partners with the SureScripts to accept e-prescriptions from physicians connected to the Surescripts network. In addition to accepting new prescriptions, we are able to send prescription renewal requests electronically. IMPORTANT-NUMBERS Managed Healthcare Pharmacy is committed to assisting you. 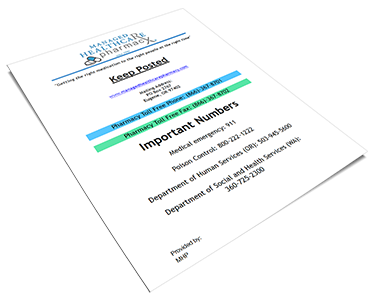 Download this Important Numbers PDF to post for quick reference.